Hello everyone! Did you know that today is World Kindness Day? This fun holiday is all about showing kindness to others; as crafters, we can use our love of creating to spread some HANDMADE kindness to those around us. I thought that this would be a perfect opportunity to share an ornament idea with you using an adorable Plush Die from Simon Says Stamp. 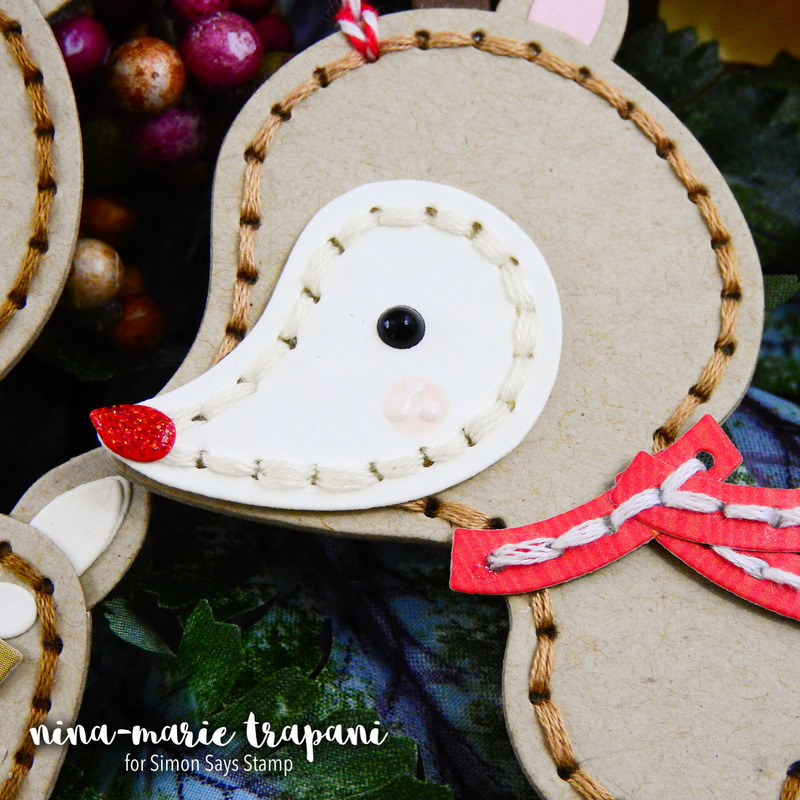 Today I’ve used the Plush Deer set, but there are many other stitching dies that you could use for today’s project as well if you do not have this one. Check out all of the fun stitching and plush dies we carry at Simon Says Stamp by clicking HERE. All of these dies could be turned into ornaments in the same way I did on these festive reindeer. While these plush dies are most often featured with felt, you can also use them with paper and cardstock! These are also great projects to use up scraps with (I know we all have lots of scraps laying around!). For some pattern and interest, I also enjoy throwing in a bit of patterned paper here and there too. 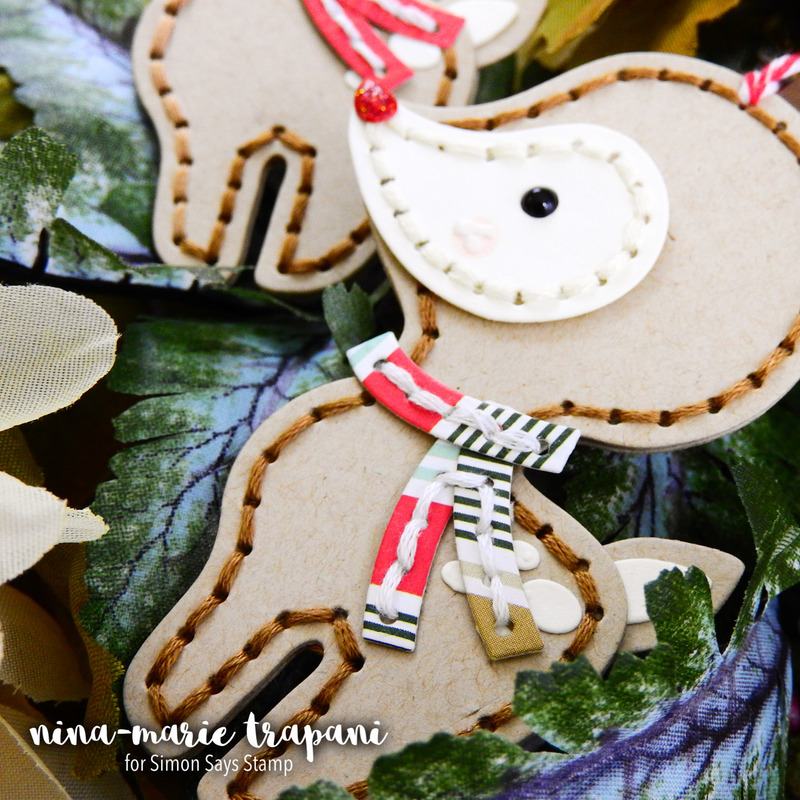 You’ll notice that the scarves on each of my reindeer are created with scraps of paper from one of my favorite Christmas pattern paper collection, Deck the Halls by Echo Park. To stitch these ornaments together, I used Iris embroidery floss and a needle. When selecting floss, I picked colors that were slightly darker than the color of paper it would be sewn onto. I like having the contrast of the floss on the paper when using slightly darker shades. Little details also make a big difference on your projects; on the face of the deer, I added Nuvo Drops on the deer’s nose, as well as his eyes. His cheeks have some rosiness that I used a Copic marker to color. These ornaments are perfect for giving to friends and family over the holidays! I plan on making a couple more of these reindeer and giving them to all the girls that work at my favorite coffee shop in town! If you make some ornaments like this, who would you give them to? 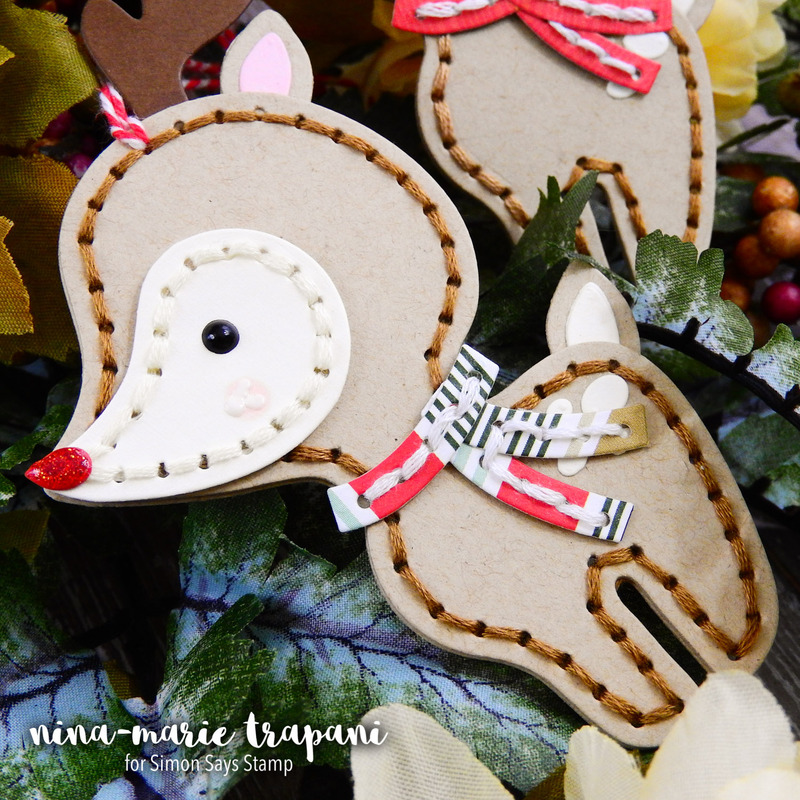 Be sure to watch the video below to see how I made the ornaments; I hope you will be trying this gift-idea out! Don’t forget to do something special for someone you know in celebration of World Kindness Day… make a card, bake a treat or do something unexpected! Random acts of kindness help make the world a better place! Blog Candy Alert!! Follow our blog via email and comment on this post for a chance to win grab bags and blog candy! Remember to tag your awesome projects with #simonsaysstamp on social media so we can see what you are creating! This is so cute Nina! I agree, these are a cute way to use up our scraps. I don’t know if I’d have the patience for this, but it’s absolutely adorable! Wow! This is just brilliant! 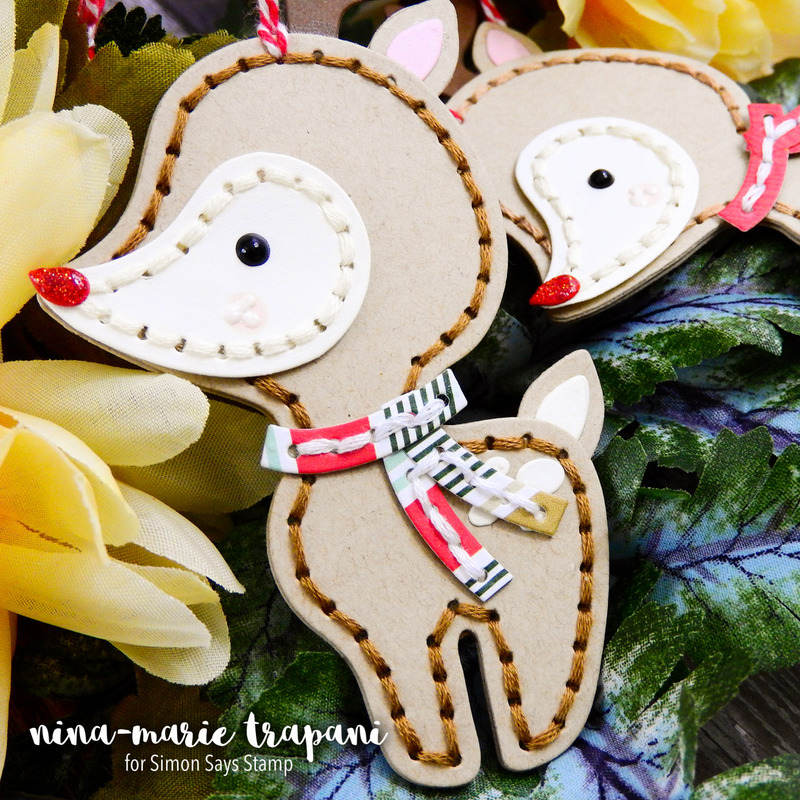 wow these ornaments are so adorable – my children will love to make these lol!!! Those deer ornaments are so cute. Thanks for sharing. 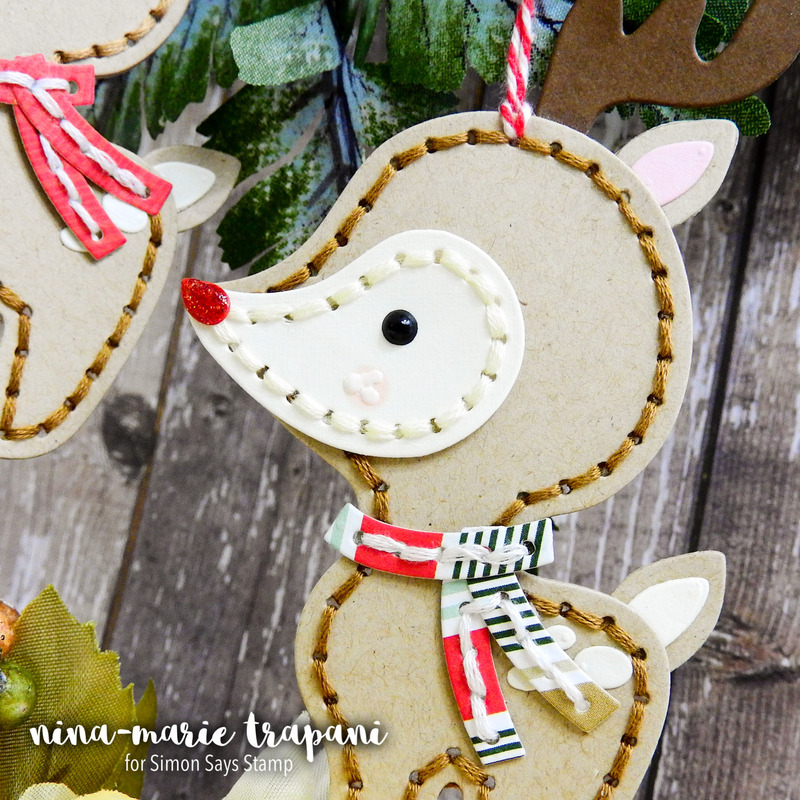 I love this stitched reindeer! Great idea! Wish I could make them! Soooo cute!! I make ornaments for my nieces & nephews every day. This is a cute idea. Really like the deer…but I’m saving my pennies to buy a penguin die! Thanks for showing us the paper…was afraid I’d have to use felt! These are really cute and would be a great addition to parcels you have to post away that fluffy bows wouldn’t be feasible on. Great idea Nina. Cute ornament! Love how you created the scarf on him! These look fun to put together! This is a really sweet idea! Thanks for the inspiration!! 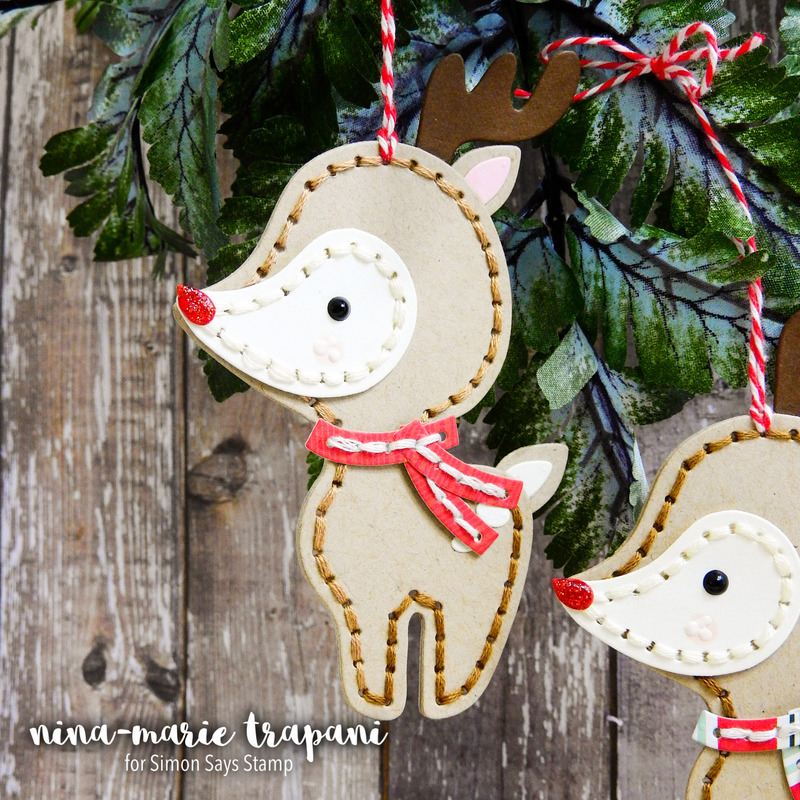 I would love to make this paper reindeer ornament and put them on packages as decorations. Super adorable reindeer. Love it. Everyday is really share kindness day, but today is really a reminder to those that sometimes forget to be nice. Your December kit is wonderful with all of its fun candy colors on the paper and embellishments. Thank you for sharing! The deer ornament is just darling! What a great idea. Such a cute project! These would be great to put on my nieces and nephews Christmas gifts! What a great idea, to make ornaments using the dies! So cute! Adorable reindeer ornaments. I could make these for the twins’ Head Start teachers. That would be so cute! I happened upon this on YouTube yesterday. The reindeer are so cute. I know the coffee ladies will enjoy getting them. Good idea, Nina! I got interupted and don’t know it I got a chance to tell you I think these are over-the-top cute! Would be great on packages! Very adorable ornaments! I have some plush dies I’m hoping to do for Christmas this year! Thanks for sharing!! Now that is way cute! very cute project, love it! Oh my ! Nobody could resist such adorable ornaments !! So, So, cute and great video. Thanks for sharing. A Very Hero Arts Holiday + Lots of Blog Candy Winners! Faber-Castell Gelatos with Tiffany Johnson!